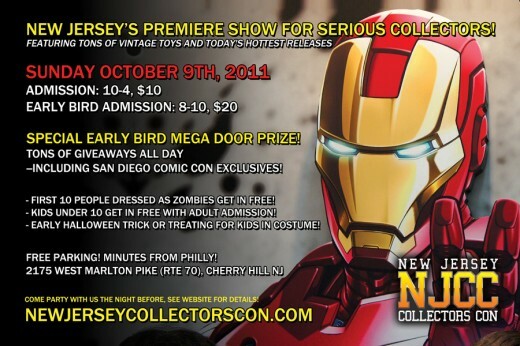 Convention for Collectors of Toys, Comics, Movies, Games and more. New Jersey Collectors Con is officially sold out of dealer space. This is excellent news for Fans and Collectors alike! NJCC 2011 has worked hard to find you the top dealers from all over the East Coast and beyond. The selection of G.I. Joe, Transformers and 80’s Action Figure merchandise is sure to please even the Hard-Core collectors. We are all looking forward to seeing you at the show and stay tuned for more NJCC updates. Error: Error validating access token: Session has expired on Wednesday, 13-Mar-19 11:20:02 PDT. The current time is Sunday, 21-Apr-19 22:01:48 PDT.